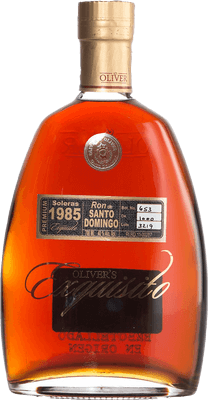 Have you found an online vendor selling Oliver's Exquisito 1985 Vintage Solera? Has a perfectly balanced taste and aroma, with some caramel and hiding cocoa. Fruityness in the nose after. Really smooth, simply great! Nice sweet taste, Nice theatre for those big money....delicious rum.a year later I was Born.thank you dominica. The color alone makes my heart beat.. Then the knowledge that oliver and oliver was there.. The hopes are high.. The scent is suddle.. Hints of loads of flaveours.. And the taste.. What a taste.. Dark, full of sugar but not sweet.. And you can feel the tastes fading for a full minute.. In general are almost all Oliver & Oliver rum good stuff. 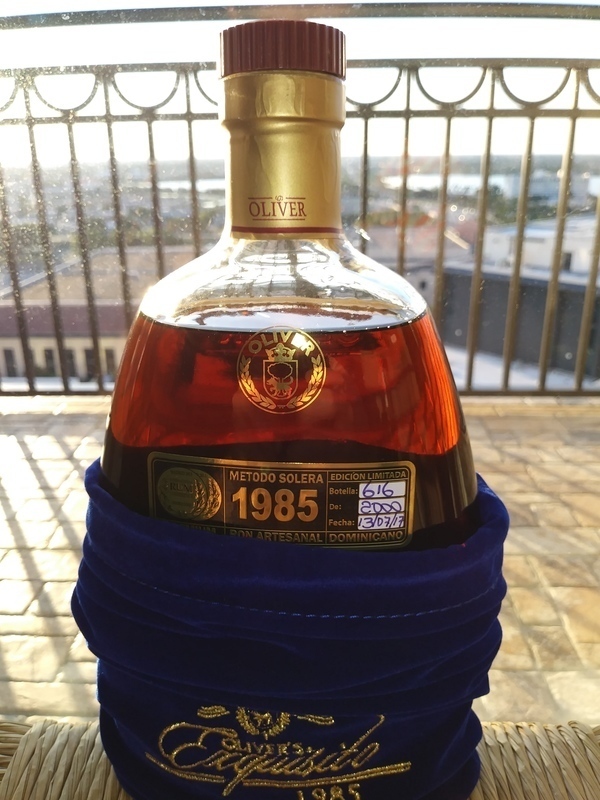 This is a very enjoyable rum to drink, it has a lot of sweetness, and a soft power. Taste : I find vanilla, oak, molasse, spices and power. The aftertaste is sweet with a soft power and few seconds after the oak and molasses comes along, nice!! Neutral aroma with cinnamon touch. Average sweetness with alcohol bitterness with cinnamon taste in the end. Ein schönes aber etwas stumpfes Mahagoni im Glas. In der Nase kommen zuerst die ganz tiefen holzigen Töne an, gefolgt von delikater Schokolade und karamellisierten tropischen Früchten. Ganz dezent im Hintergrund auch erdige Noten von Moos und Harz. Im Gaumen sehr sanft, Karamell, Schokolade, Banane, Vanille, Holz …….. und vieles mehr. Sehr gut ausbalanciert und komplex, süss aber nicht so süss wie andere Olivers. Im Abgang sehr voluminös nach Schokolade, später gesellen sich noch Holz und Karamell dazu. Ein leckerer Solera der ein wenig vom üblichen Oliver Profil abweicht. Für Einsteiger und Liebhaber von süssen Rum zu empfehlen. Braucht eine lange offene Zeit zum atmen. A beautiful but slightly dull mahogany in a glass. In the nose, the very deep woody tones arrive first, followed by delicate chocolate and caramelised tropical fruits. Quite discreetly in the background also earthy notes of moss and resin. On the palate very soft, caramel, chocolate, banana, vanilla, wood......... and much more. Very well balanced and complex, sweet but not as sweet as other Olivers. A very voluminous chocolate finish, later joined by wood and caramel. A delicious Solera that deviates a little from the usual Oliver profile. Recommended for beginners and lovers of sweet rum. Takes a long open time to breathe. Tasty and complex but too woody and leathery when compared to the rest of the premium O&O rums. Ein muss!! Und Zwei müssen!! Smell is soft and good. Probabil un rom bun, pentru alții. Din cauza gustului prea puternic de marțipan nu pot aprecia acest rom. Am dat 7 doar pentru ca am înțeles ca e un rom bun..
Beautiful dark color, a great oak taste and a great balance between sweetness and a good burn. 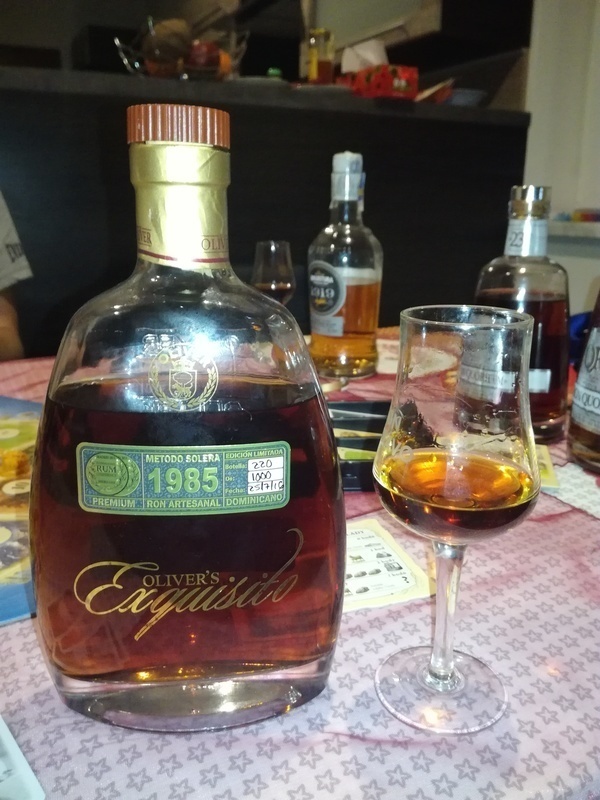 Tried the Exquisito 1985 with very high expectations and the rum is very good in isolation, but unfortunately a long way from a perfect ten. Color is deep dark, smell test reveals a bouquet of nice aged dark rum aromas, but the taste test reveals this is way too sweet and there's still a surprisingly strong afterburn. Great rum from Oliver & Oliver, but struggles to earn anything higher than an eight. My favorite rum so far. Beautiful dark color, a great oak taste and a great balance between sweetness and a good burn. The rum is classic Oliver y Oliver. Smooth and sweet. The nose is very nice with hints of caramel. The taste could use a bit more "bite" for my taste, but a great rum nonetheless. Co napsat. Ročník 85 je pro mne velice specifický. Je to ročník nejen mého narození, ale i ročník tohoto báječného rumu. Skvělá volba. Vůně prázdné sklenice je velice exklusivní a příjemná. Velice rád opět vyzkouším.